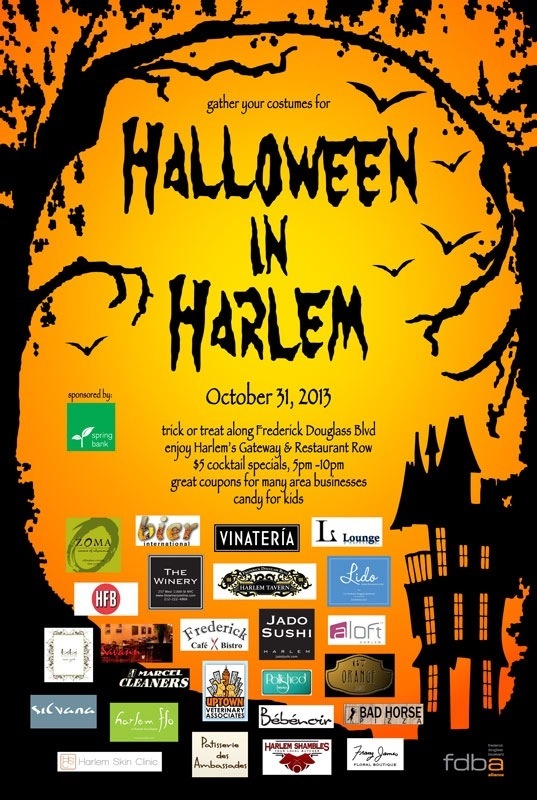 Spend Halloween in Harlem, Frederick Douglass Boulevard Alliance to host event October 31 | HarlemGal Inc. Need plans for Halloween? How about spending Halloween on Harlem’s restaurant row? The Frederick Douglass Boulevard Alliance (FDBA) is organizing a Halloween in Harlem party along Frederick Douglass Blvd. Several businesses shown below with their logo will be handing out candy to trick or treaters and decorating their windows for all passerby’s to view. For those without little ones, select restaurants will have $5 drink specials from 5 pm – 10 pm and be handing out 10 percent off coupons good retail partners with their logos listed below as well, such as BebeNoir, Bibi Salon, Harlem Flo, Franz James, Harlem Shambles and more! See you along the boulevard for Halloween! This entry was posted in 5 and Diamond Harlem, Bars, bier international, Chocolat, Events, food, Frederick Cafe Bistro Harlem, Frederick Douglass Blvd., Harlem, Harlem bloggers, Harlem blogs, Harlem businesses, Harlem Food Bar, Harlem Restaurant Row, Harlem restaurants, HarlemGal, Les Ambassades Harlem, Lido Harlem, Lido Italian Restaurant and Bar, Maharaja Palace Harlem, Melba's Restaurant Harlem, restaurant row, restaurants, Silvana, The Park 112 Harlem, The Park Wine Bar, Things to do in Harlem and tagged Bebenoir, bibi salon, Franz James, Frederick Douglass Blvd., Frederick Douglass Boulevard Alliance, Halloween, Harlem, Harlem Flo, harlem restaurant row, Harlem Shambles, Harlem's Restaurant Row. Bookmark the permalink.